Thank you all for being patient with me as I deal with that thing we call "life." Between family and friends and work...I have been busy! 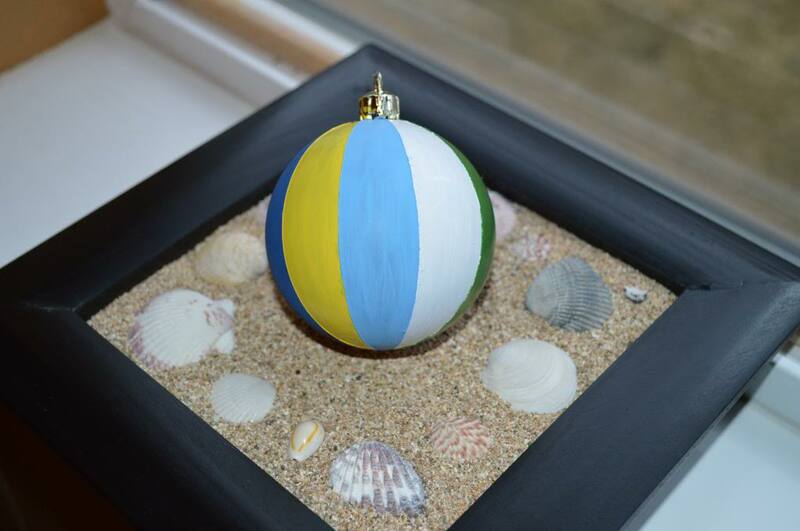 First and foremost, the Beach Ball painting project is DONE! There are a few things I would have done differently. You'll notice that the dark blue panel is way larger than the other ones. 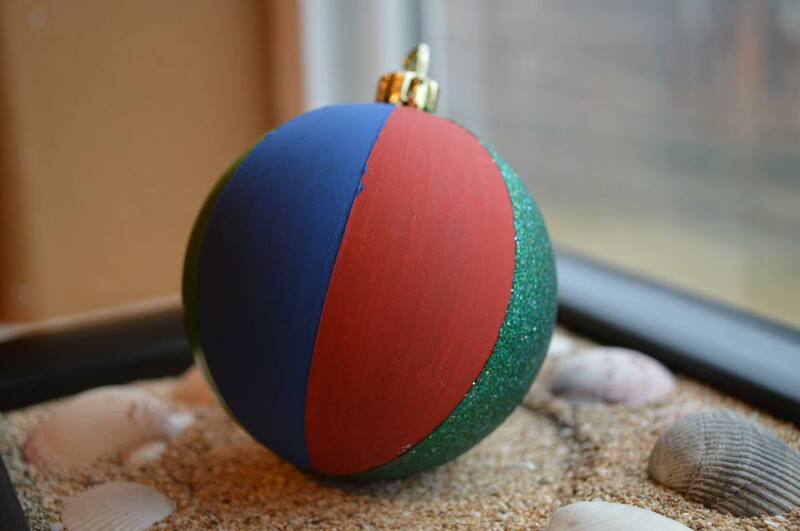 It's the first one I did and that was the size I was going for but for some reason, it didn't work out that way. Overall, I think it turned out great! It will be the perfect addition to my Barbie beach scene. (And once I go to Hawaii I can grab more sand for that setup.) Maybe by then I will be the proud new owner of a Barbie pool! I'm still looking around for one! And now that this project is done, I can again fixate on the "Benny" doll project. Yay! Can't wait to get him finished. And today I wanted to post a doll from my childhood collection. At the beginning I mentioned family. My husbands cousin, wife, and children came over last weekend. (Would that make their kids my 2nd cousins?) Two adorable little girls, 7 and 11. We went into my Barbie room to pick out a Disney movie and of course, their eyes were glued right to the Barbie shelves. Both: Which one has the shortest hair? (They voted this one which is probably true.) I had to cut the already cut hair to fit the wig on. Both: Which one has the longest hair? Which brings me to my Collection Showcase. Both their eyes fixated on this doll. The super fabulous Totally Hair Barbie. I got this doll brand new when I was a kid and she is one of my top 5 favorite dolls of all time. Now she by no means has the longest hair of any doll I have (That would be Jewel Hair Mermaid Teresa) but because she is positioned at the end of my shelf, they saw the hair and immediately voted this one to be the longest. And of course, had to touch it as well. Because, this long hair just begs to be touched right? I never ever ever brushed her hair. 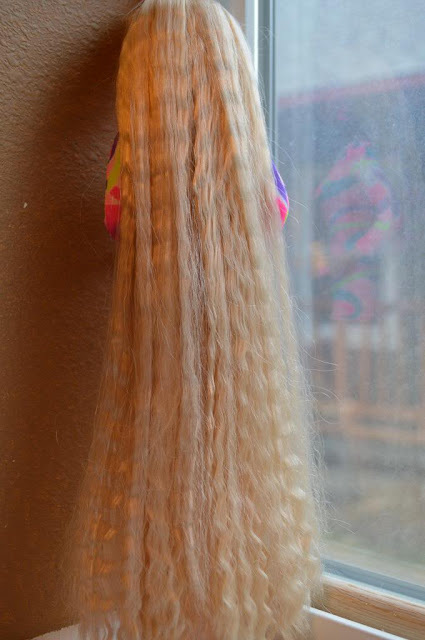 I never wanted the crimps to fade or for it to frizz. So she always had the perfect hair with a light pick here and there and is still as perfect as the day I got her. She always had the same bangs because I used to style mine like that believe it or not! Don't you love the sweet face? 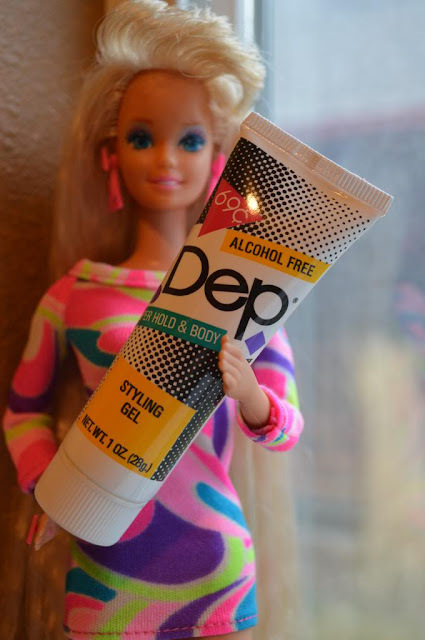 The cool thing you received with this doll is your very own bottle of Dep styling gel for you and Barbie! She also came with some different colored rubber bands, and another couple of hair accessories which is in one of my boxes somewhere. I'll post them when I can dig them out. I remember one is a long pink piece of fabric with a wire in it with some ribbon curls on the end. So super cute. Look, I found a picture of it on google! I love her. She is so beautiful. And you can't say no to that mod print mini dress! So friends, do you have Totally Hair Barbie? Do you love her as much as I do? Let me know in the comments! I am hoping to have more of the Benny sewing project up soon. We'll see how the days go! I found two Totally Hair Barbies at a secondhand store. They were a great bargain... but their hair was so tangled, I couldn't save it! One is awaiting a re-root. I'd like to make her hair long and blonde again. The other got a major trim and a pink dye job. She looks like Jem and is very cute. I hope your reroot is successful. The long hair is just so fun! Maybe you can crimp it too just like the original. :) I can only imagine how tangled they would be had they not been taken care of. I've purchased long hair dolls second hand, yikes!!! I love pink hair too. I bet she is adorable especially with that dress. I wish more dolls had long long hair. 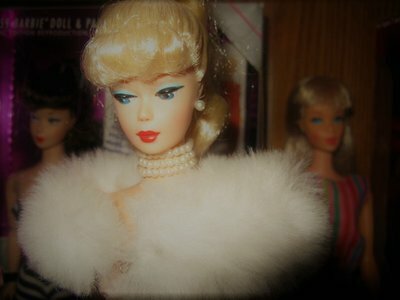 I remember looking at some dolls in the store recently and no one had that long of hair, even the hair stylist doll. 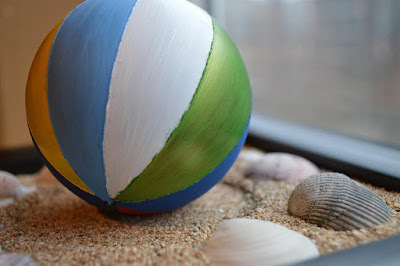 Your beach ball turned out fine. If the larger blue panel bothers you: you can always turn that to the back of your display, so it'll be less visible. Back in the day when that line was released, I scored Whitney. I left her in her box though, because I was afraid to mess up her hair. During the years I managed to find the whole line loose on several yardsales and fleamarkets. Their dresses are so mod, super cool. 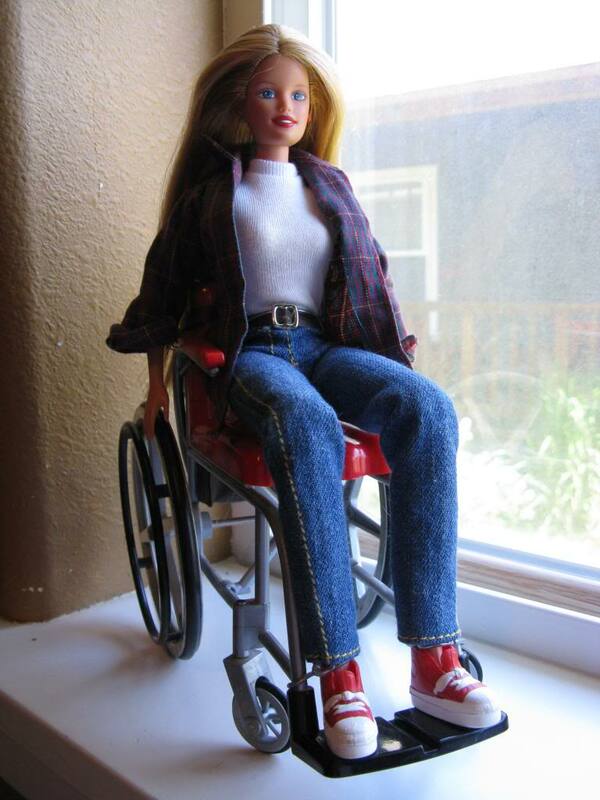 Your Barbie is in great condition. Yes today's hair play dolls are a little lame compared to Ultra Hair dolls. I bet little girls would love to have a doll with really long hair to play with. Congrats on Whitney! She was the rare Skipper Friend right? 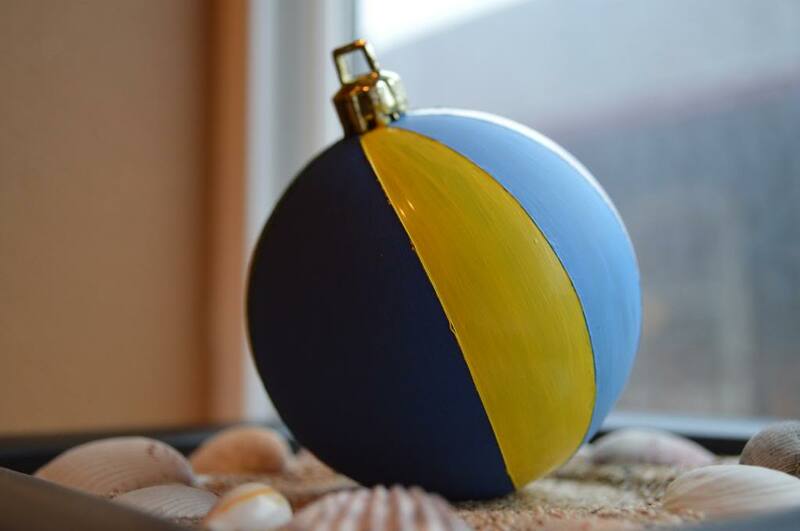 I would love to have the whole set. Wasn't there a Ken too? Long hair is just so much fun. I don't know anyone who doesn't love to play with long long hair, especially young girls! 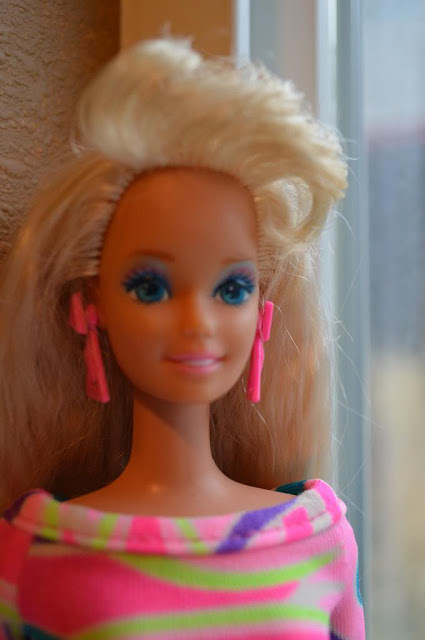 Actually Whitney is a Barbie friend using the Steffie mold, she was only included in a few lines and the Ultra Hair Whitney was exclusive to Europe. The rare Skipper friend was called Courtney. There also was a Stacie friend called Whitney, but that was towards the end of the 90ies. Yes there was a Ken too. Ah Whitney, that's right. I guess I got the -ney at the end of the names mixed up. That's awesome you scored her! While sorting through the clothes i got last week, I found, I thought, this dress! 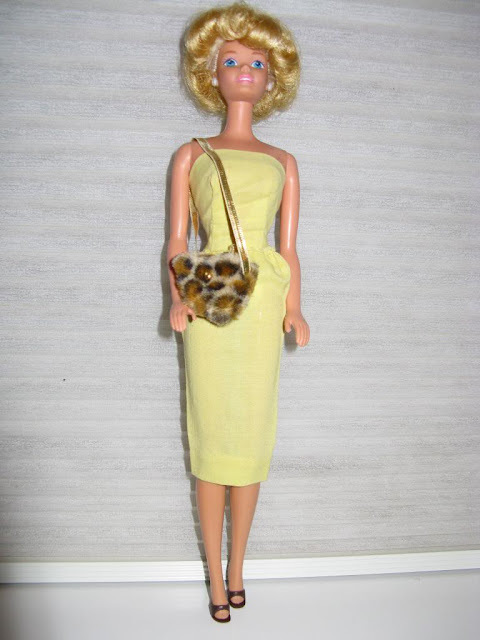 However mine did not fit Barbie likes yours. After doing a bit of research, it turns out I have the top for a totally hair Skipper.